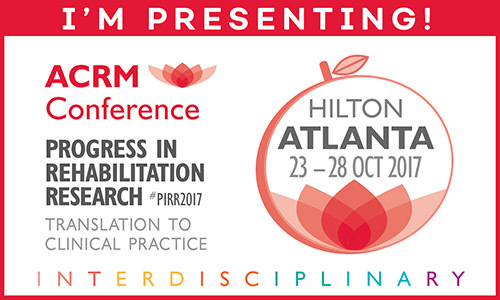 THANK YOU for joining the faculty of the ACRM 2017 Annual Conference, Progress in Rehabilitation Research (PIRR). We appreciate your commitment and strive to make your ACRM presenter experience as stress-free, productive, and enjoyable as possible. This webpage is designed to provide the resources and information you need and will be updated frequently. If you don’t find the answers to your questions here, please contact Cindy Robinson at speakers@ACRM.org. We’re here to help! Acceptance /Refusal Notifications have now been sent via email to all submitters. If you did not receive your notification, please contact Cindy Robinson. NOW: If you have not already confirmed your team’s participation on the scheduled date and time, please do so immediately by contacting Cindy Robinson. 13 AUG: FINAL Poster Presenter Registration Deadline – Poster Presenters who are not registered for the conference by this deadline will forfeit publication of their abstract in the Archives of PM&R. Register Here. 24 AUG: Acceptance/decline notifications due to Late-Breaking Research abstract submitters. 31 AUG: Poster award eligibility deadline – To be eligible to participate in the ACRM Poster Awards Program, your poster file (PDF or PPT) must be uploaded by this date. *Revisions received AFTER 20 October will NOT be preloaded to ACRM laptops for presentation onsite. Please book early at the Hilton Atlanta, conference headquarters, and enjoy the convenience and savings of staying onsite. There is no deposit required at booking and no penalty for cancellations made by 3:00 PM three days prior to your reservation. By booking in the ACRM discounted room block, you also help ACRM meet its hotel contract obligation. Thank you! A profile has already been entered for you in the registration system. To ensure you pay the lowest possible rate, please login with the same email address provided in your submission. If this is your first visit to registration, please use the default password: Password1. 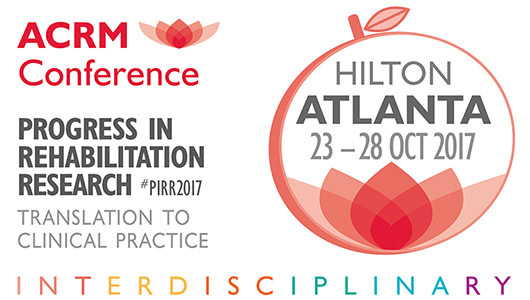 *If you are able to join us for the full conference, ACRM will take $100 OFF your CORE Conference registration. If you are a student, resident, fellow, or early career professional, please contact Member Services to receive the deepest registration discount ACRM offers. *Presenters who qualify for “Student/Resident/Fellow” or “Early Career” rates do not qualify for an additional $100 Presenter/Author Discount. Single-day and WORLD PASS registrations are also excluded from this offer. If your institution will be paying for your registration, you may select “Bill Me” at checkout. This will secure your registration at the current rate and allow up to 30 days for remittance of payment. Register NOW! Rates will go up. If this is your first visit, use the default access key Password1. If you anticipate your institution will pay your registration, please register now to secure the lowest rate and select “Bill Me” at checkout. This will give your institution 30 days to remit payment. If you register for the Core Conference and are eligible for the Presenter/Author Discount, the registration fee displayed at checkout will reflect your discount. If you need assistance with the registration process, please contact MemberServices@ACRM.org. In 2017, ACRM will proudly recognize the best scientific posters with the following awards. PLEASE NOTE: To be eligible to participate in the ACRM Poster Award Program, your poster file (PDF or PPT) must be uploaded no later than 31 August. Poster display boards are landscape format measuring 4′ H × 8′ W (122 cm Height x 243 cm Width). Posters may be any size as long they will fit on the poster display board. The suggested size is 42” x 90”. Pushpins for mounting will be provided. There is a FedEx Business Center onsite that may be useful to you. Call them at +1.404.223.0836. Poster Presentation: Poster presenters must staff their poster on Thursday, 26 October from 3:45 PM – 4:45 PM. Please be prepared to stand by your poster, present your findings and answer attendee questions during this time. *Posters that are not picked up by 5:30 PM will be removed and disposed of by staff. PLEASE NOTE: Your poster must be displayed for viewing from 7:00 AM on Thursday, 26 October until 2:30 PM on Friday, 27 October. Each presenter is allotted 18 minutes to present their scientific paper and answer questions. Audio/visual equipment may be used to supplement the presentation. Whenever possible, papers will be grouped by their focus, with up to four papers being moderated within a 75-minute session block. In direct response to 2016 attend feedback, this year, all papers will be presented on the same day/time, SAT 28 OCT from 9:45 AM – 11:00 AM to draw attention to this important work. 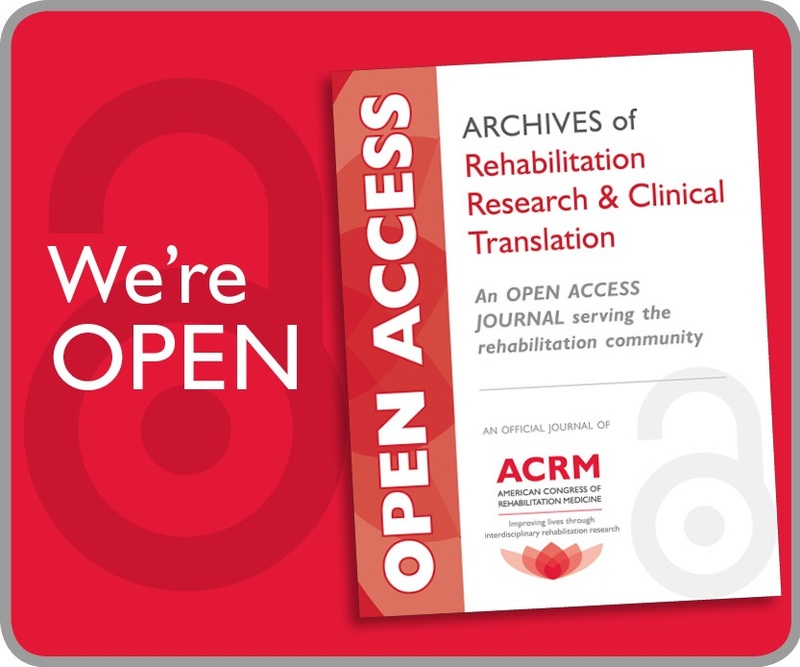 The abstracts of all scientific papers and posters presented at this year’s annual conference will be published in the online October issue of the ACRM journal, the Archives of Physical Medicine & Rehabilitation, if the abstracts’ presenters are registered for the conference by 24 July 31 July. 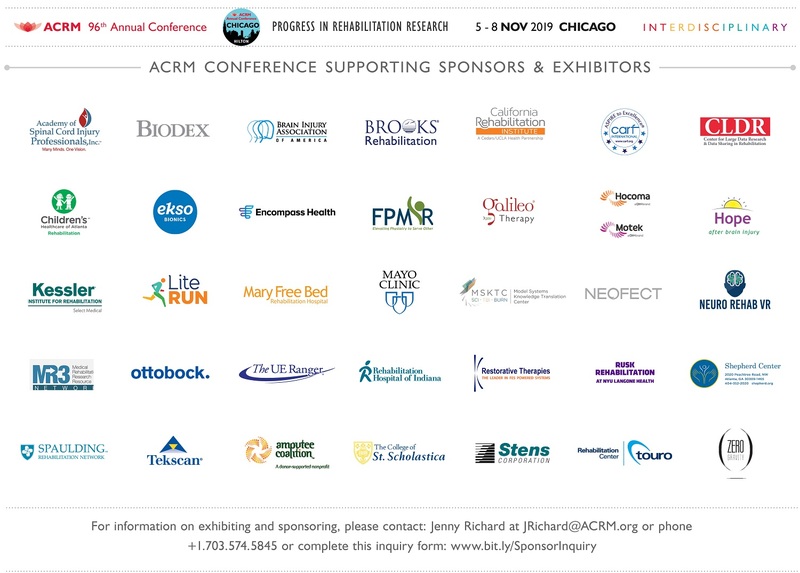 As an ACRM presenter you are encouraged to show your affiliation with ACRM before, during, and after the Conference. Please use these graphics in social media, on your websites, and in your email signatures. 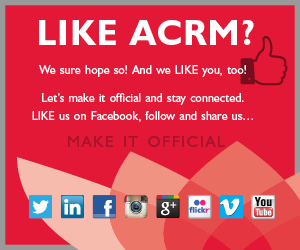 ACRM is proud to associate with YOU. 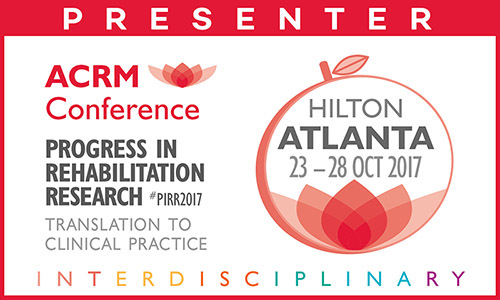 And we want to help amplify your dedication to rehabilitation, your research and your session at ACRM. Please let us know if you would like any other collateral. Email graphics@ACRM.org. We are here to help you maximize your participation with ACRM. Please use these asset files to help connect with audiences & help find new ones. 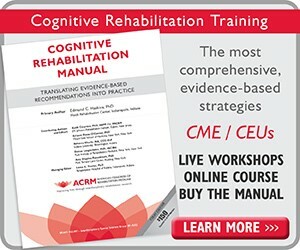 Only official attendees, exhibitors, and sponsors, and Institutional Members are allowed to use these ACRM asset files. Unauthorized use of these ACRM properties is prohibited. No one knows your presentation better than you. That’s why ACRM has developed a wide variety of promotional tools to help you inform and invite the professionals who will benefit most by attending. Check out the ACRM Marketing Toolbox and take your pick of graphics, logos, webpage links, and banner ads. Use them to effectively promote your session at your own institution, to students and mentees, and like-minded colleagues through your professional listservs, email communications, social media and PowerPoint presentations. The primary presenter of each symposium, instructional course or oral presentation is required to upload their final presentation file (PPT or PDF) to the Speakers Portal by Thursday, 28 September 5 OCTOBER 2017. PowerPoint presentations in standard format are preferred. You will have an opportunity to make cosmetic revisions to your PowerPoint presentation. Please see CE Compliance slides for more information about the Compliance Slides that must be included in each presentation. One set of Compliance Slides is required for each presentation and should represent all participating presenters. Minor revisions can be made to your presentation through the Speakers Portal until 20 October. The version uploaded as of 20 October will be preloaded to ACRM laptops for onsite presentation. You must notify meetings@ACRM.org if significant changes to your presentation are needed. ACRM will make all presentations available to conference attendees for a fee. YOU MUST NOTIFY ACRM IF YOU DO NOT WISH YOUR PRESENTATION TO BE INCLUDED FOR DISTRIBUTION no later than Tuesday, 10 October 2017 by emailing meetings@ACRM.org with the session ID, session title, presenter name, email address and specific direction to exclude specific presentation file or all presentation files for the session. To facilitate a smooth flow of sessions in each meeting room and reduce opportunities for technical difficulties, we will preload the laptops for each room daily with the presentations provided by presenters. All submitted presentations will be ready to run at the start of each session. Our aim is to start and end each session on time. Any revised presentations must be uploaded to the Speaker Portal by midnight (11:59 PM EST) on 20 October. If changes are needed after this deadline, presenters must come to the speaker ready room AT LEAST 24 HOURS prior to their presentation to ensure the final version is loaded. IMPORTANT: Presentations that are not received at least 24 hours prior to their scheduled presentation will NOT be preloaded to an ACRM laptop for use onsite. If you require a microphone, plan to use video with sound or require special accommodations (e.g., ramp, stool), please let us know immediately by emailing meetings@acrm.org. Please include your name, session ID and session title. If you have already received confirmation, there is no need to alert us again. Requests for a microphone and audio or video equipment on site will be granted on a first come, first served basis and availability cannot be guaranteed. Please notify us by email no later than 2 September. If updated presentations are brought to the speaker ready room the day of the presentation, we will not be able to preload the ACRM laptop with the latest for your use. an updated version will not be loaded on the laptop in the presentation room. Handouts are not required and are your responsibility if you choose to provide them. Presentations and poster files will be available in the digital conference proceedings — included with WORLD PASS and available for purchase a la carte. Using Video in Your Session? If your presentation uses video with sound, please let us know by emailing meetings@acrm.org no later than 28 September 2017 so we can ensure the session room is set up properly. Feel free to visit the Presenter Ready Room to test the presentation and video. You are also welcome to bring your presentation on a USB stick or even your own laptop if you are concerned about the video playing properly. If you elect to use your own equipment, we highly recommend that you visit the Presenter Ready Room in advance to test your presentation. If you have not previously let us know that you will be requiring audio or video equipment for your presentation, we cannot guarantee the availability of audio or video equipment in the classroom in which you are presenting.